However, believe it or not, customer satisfaction surveys have a little bit of quantum mechanics in them! Such surveys exhibit the Heisenberg uncertainty principle in that surveying a customer can, in itself, change the perception of that customer. My reason for raising this phenomenon is definitely not to suggest that marketers go out and attempt to influence customers by surveying them. That approach is not only un-ethical but also illegal in some jurisdictions. No, my reason for raising it is to reinforce that a customer survey is in fact another key customer contact and must be conducted in a way that reflects the way that you want your brand and company to be perceived. As an example, we often perform customer service surveys for high value business to business organizations. Our conversations with these clients invariably start with them wanting to perform an internet based customer service survey to gain insights into customer satisfaction and loyalty. I will often ask them what they do as the CEO/COO/CFO of a large organization when they receive an internet survey. “I delete it” is the common reply. I then ask them if an internet survey makes them feel that their opinion is valued?” “No”, is the common response. It’s at this point that they understand that information transfer during the survey process not just from customer to company but also company to customer. Because it is two way and our clients often decide to stratify their survey methodology by customer value to provide an appropriate survey interaction for different customer types. We often suggest of face to face interviews for high value customer contacts. This approach makes the customer feel the most valued and creates the best rapport with the interviewer. It also gathers the most qualitative information regarding the users’ perceptions and how to improve those perceptions. Note that the person performing the survey must be properly trained to avoid interviewer bias. They must also dressed appropriately and be able to demonstrate a reasonable grasp of the interviewees high level business drivers for this approach to be effective. In the same way that face to face interviews provide excellent feedback from key staff, mid-importance customer contacts can be interviewed by telephone. This approach offers a good mix of cost control (they are less expensive than face to face surveys) and are able to gather substantial qualitative information. This approach is not without merit. It provides the ability to reach larger numbers of end users and provides solid quantitative outcomes for the scoring of various service elements but provides relatively less qualitative information. 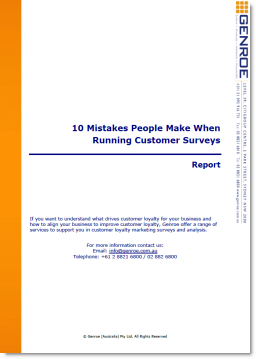 So the next time that you are considering your customer survey methodology consider that how you perform a survey says as much about your organization as the products and services that it surveys. Do you have a question about customer loyalty or satisfaction surveys? Ask it below and I’ll respond.